The world’s attention has been focused on the Middle East. We are confronted daily with scenes of carnage and destruction. Can we understand such violence? Yes, but only if we come to the situation with a solid grounding in the facts of the matter-facts that too often are forgotten, if ever they were learned. Below are twenty facts that we think are useful in understanding the current situation, how we arrived here, and how we might eventually arrive at a solution. 2. The Palestine Liberation Organization (PLO) was founded in 1964-three years before Israel controlled the West Bank and Gaza. The PLO’s declared purpose was to eliminate the State of Israel by means of armed struggle. To this day, the Web site of Yasir Arafat’s Palestinian Authority (PA) claims that the entirety of Israel is “occupied” territory. * It is impossible to square this with the PLO and PA assertions to Western audiences that the root of the conflict is Israel’s occupation of the West Bank and Gaza. 5. Israel has, in fact, returned most of the land that it captured during the 1967 war and right after that war offered to return all of it in exchange for peace and normal relations; the offer was rejected. As a result of the 1978 Camp David accords-in which Egypt recognized the right of Israel to exist and normal relations were established between the two countries-Israel returned the Sinai desert, a territory three times the size of Israel and 91 percent of the territory Israel took control of in the 1967 war. 6. In 2000, as part of negotiations for a comprehensive and durable peace, Israel offered to turn over all but the smallest portion of the remaining territories to Yasir Arafat. But Israel was rebuffed when Arafat walked out of Camp David and launched another intifada. 7. Yasir Arafat had never been less than clear about his goals-at least not in Arabic. On the very day that he signed the Oslo accords in 1993-in which he promised to renounce terrorism and recognize Israel-he addressed the Palestinian people on Jordanian television and declared that he had taken the first step “in the 1974 plan.” This was a thinly-veiled reference to the “phased plan,” according to which any territorial gain was acceptable as a means toward the ultimate goal of Israel’s destruction. 8. The deceased Faisal al-Husseini, a leading Palestinian spokesman, made the same point in 2001 when he declared that the West Bank and Gaza represented only “22 percent of Palestine” and that the Oslo process was a “Trojan horse.” He explained, “When we are asking all the Palestinian forces and factions to look at the Oslo Agreement and at other agreements as ‘temporary’ procedures, or phased goals, this means that we are ambushing the Israelis and cheating them.” The goal, he continued, was “the liberation of Palestine from the river to the sea,” i.e., the Jordan River to the Mediterranean Sea-all of Israel. 9. To this day, the Fatah wing of the PLO (the “moderate” wing that was founded by Arafat himself) has as its official emblem the entire state of Israel covered by two rifles and a hand grenade-another fact that belies the claim that Palestinian leadership desire nothing more than the West Bank and Gaza. 11. Over three-quarters of Palestinians approve of suicide bombings-an appalling statistic but, in light of the above facts, an unsurprising one. 12. There are 21 Arab countries in the Middle East and only one Jewish state: Israel, which is also the only democracy in the region. 13. Israel is the only country in the region that permits citizens of all faiths to worship freely and openly. Twenty percent of Israeli citizens are not Jewish. 14. While Jews are not permitted to live in many Arab countries, Arabs are granted full citizenship and have the right to vote in Israel. Arabs are also free to become members of the Israeli parliament (the Knesset). In fact, several Arabs have been democratically elected to the Knesset and have been serving there for years. Arabs living in Israel have more rights and are freer than most Arabs living in Arab countries. 15. 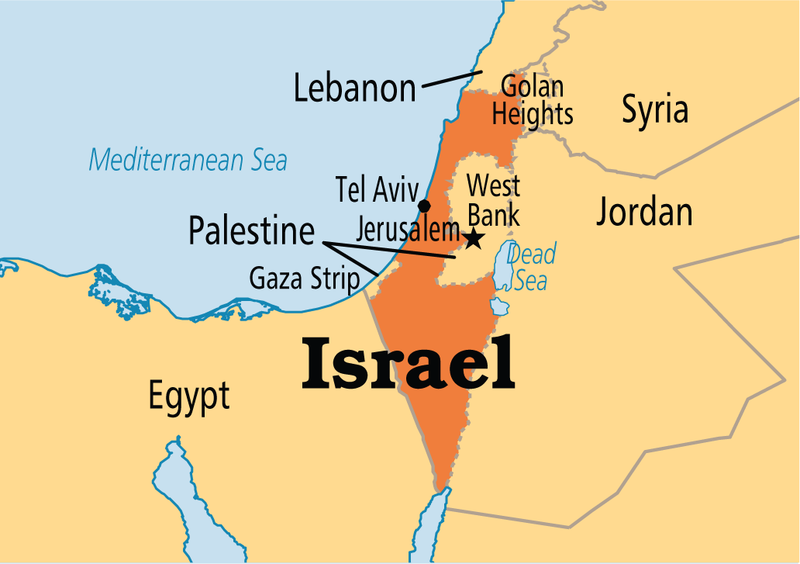 Israel is smaller than the state of New Hampshire and is surrounded by nations hostile to her existence. Some peace proposals-including the recent Saudi proposal-demand withdrawal from the entire West Bank, which would leave Israel 9 miles wide at its most vulnerable point. 17. Israel has, of course, conceded that the Palestinians have legitimate claims to the disputed territories and is willing to engage in negotiations on the matter. As noted above, Israeli Prime Minister Ehud Barak offered almost all of the territories to Arafat at Camp David in 2000. 18. Despite claims that the Israeli settlements in the West Bank are the obstacle to peace, Jews lived there for centuries before being massacred or driven out by invading Arab armies in 1948-49. And contrary to common misconceptions, Israeli settlements-which constitute less than two percent of the territories-almost never displace Palestinians. 19. The area of the West Bank includes some of the most important sites in Jewish history, among them Hebron, Bethlehem, and Jericho. East Jerusalem, often cited as an “Arab city” or “occupied territory,” is the site of Judaism’s holiest monument. While under Arab rule (1948-67), this area was entirely closed to Jews. Since Israel took control, it has been open to people of all faiths. 20. Finally, let us consider the demand that certain territories in the Muslim world must be off-limits to Jews. This demand is of a piece with Hitler’s proclamation that German land had to be “Judenrein” (empty of Jews). Arabs can live freely throughout Israel, and as full citizens. Why should Jews be forbidden to live or to own land in an area like the West Bank simply because the majority of people is Arab? In sum, a fair and balanced portrayal of the Middle East will reveal that one nation stands far above the others in its commitment to human rights and democracy as well as in its commitment to peace and mutual security. That nation is Israel.